A monotypic genus, of temperate and tropical America. Type species: Zizania miliacea Michx. Zizania miliacea Michx. Fl. Bor. Am. I: 74. 1803. Z. miliacea Doell & Aschers. ; Baill. Hist. PI. 12: 293. 1893. Culms 4°-l5° tall from a long and creeping root-stock, robust, glabrous. 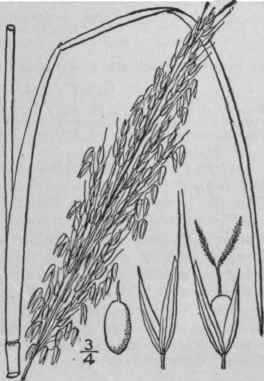 Sheaths loose, glabrous; ligule 4"-7" long, thin-membranous; blades 1° long or more, 1/2'-l' wide, smooth, glabrous; panicle dense, i°-i 1/2° long, narrow; branches erect; staminate spikelets 3"-4" long, the outer scale 5-nerved, the inner 3-nerved, both acute; pistillate spikelets about 3" long, the outer scale about equalling the inner, bearing an awn 1"-3" long, scabrous, 5-nerved; inner scale 3-nerved, acute. Swamps. Virginia to Ohio (according to Riddell), south to Florida and Texas. June-July.